PERC offers a number of themed bags - kits full of materials that all revolve around a specific topic. Some of these include potty training, nursery rhymes, colors and shapes, and kindergarten preparation. 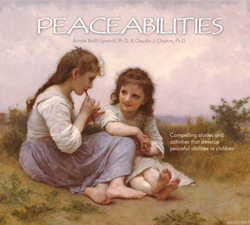 One that we'd like to introduce you to is called Peaceabilities. This system was developed by BYU professors to help children deal with interpersonal relations and to quell tendencies toward conflict and violence. An entire set of Peaceabilities materials was donated to PERC and we are offering it as a themed bag. This system includes eighteen children's books and a variety of activities for children ages 6-11. It would be good for any child, not just those struggling with conflict among friends and family. For more information, visit http://creativeworks.byu.edu/peace/overview.htm or stop by PERC and check it out!